Now let’s talk of woody wolf black in the forest trance-inducing floating metal. 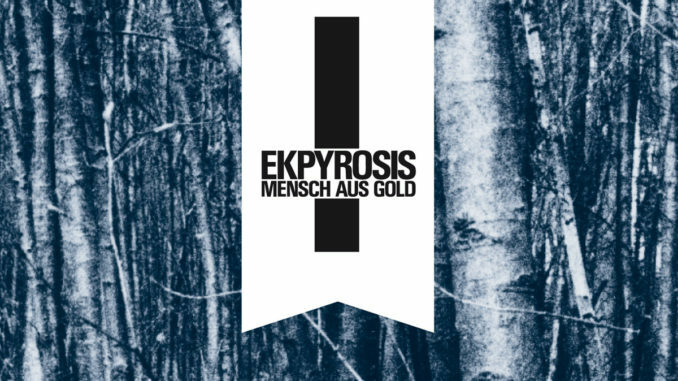 The German band Ekpyrosis have just released their Mensch Aus Gold – the golden man, or the man made of gold – and are set to explore the very atmosphere of musical transcendence through repetitive riffs, blast beating soothing patterns and ritualistic mysteries. As a good and obedient boy, I’ve done my research and the band’s name points out to the Stoic conception of a world-engulfing cosmic fire out of which a new world is generated (ek– out of – pyr – fire), so it felt a bit like going back to my earlier studies of Zeno of Cithium and his numerous descendants. First of all, I wouldn’t say this is as weird and psychedelic as the label seemed to pass it for, but it’s certainly experimental by nature and Ekpyrosis tend to have a sound of their own. The production surprised me at first glance and as strange as this might actually seems, the band playing kind of reminded me of Darkthrone’s graveyard-bashing Under a Funeral Moon and Ulver’s ice-cold Nattens Madrigal altogether, though with many more layers of sound and a clearer, crispy crystal sound design, that turns the only song presented here into an alter, alternate and alternative rock version of Black metal. The riffing patterns are slow-moving, minimalistic yet grandiose, taking their time to fully circle around themselves in subtle chord progressions and very catchy murky head-banging. And for the thirty-one minutes ride, you get plenty of those riffs, believe me! It’s strange how without being repetitive at all, the band nevertheless gives the impression that they convincingly follow a red thread from beginning to end. The music in general isn’t dissonant nor disharmonic but more melodious and enthralling, and I would say the band’s specific brand of weirdness lies dormant somewhere in those lines of epic and contemplative feelings. During much of the album, the singer appears to be sort of confusingly talking or at least spoken wording things that I can’t understand at all. Once in a while, he ventures into singing borderline off kilter chants, yet as out of tune as he comes close to, his diverse voices add a great deal of atmosphere around the already grand and inspired music. It makes the album even more unique. So whether you’re into mystical punk ‘n roll, transcendental epic Black buzzy hypnotive blast groove, or golden man made lyrical harmonies, Ekpyrosis might be the way to go.